BioAstin® Astaxanthin is a proprietary supplement ingredient offered by Cyanotech Corporation, promoted as one of the strongest natural antioxidants available. It is said to be the world’s best selling brand of natural astaxanthin for humans and it has been reviewed for safety by the US Food and Drug Administration (FDA). 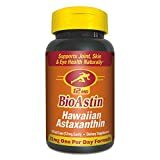 This branded form of astaxanthin is found in Nutrex Hawaii’s BioAstin® Hawaiian Astaxanthin 12 mg Gel Caps. Other ingredients in this product include vitamin E (as d-alpha tocopherol) and fats from safflower oil. BioAstin® astaxanthin supplements are promoted to support a variety of health benefits, including combating oxidative stress, supporting healthy immune function, increasing energy levels and promoting joint health. BioAstin® astaxanthin has also been found to help protect the cardiovascular system, to improving dermatological (skin) health, eye health and to support brain health. Human research on BioAstin® is currently limited, but there has been significant animal and in vitro research. Astaxanthin is considered to be safe and is generally well-tolerated by people who take it. Astaxanthin products are used to generally support health and wellness by combating free radical damage. This supplement has been researched for its effects on cancer, hypercholesterolemia, Parkinson’s disease, Alzheimer’s disease, stroke and age-related macular degeneration. BioAstin® and other sources of natural astaxanthin have been found to exhibit up to 550 times the antioxidant potential of Vitamin E. This compound also exhibits greater antioxidant potential than beta-carotene (provitamin A) and Vitamin C.
While there has been promising initial research into the effects of astaxanthin extract, there is insufficient evidence regarding its use for preventing or treating certain medical conditions. More research is needed to determine its efficacy for conditions including male infertility, menopause, obesity, carpal tunnel syndrome, dyspepsia (indigestion), muscle soreness, RA (rheumatoid arthritis) and/or wrinkled skin. Cells in the human body are attacked by millions of free radical particles every day. These free radicals are generated naturally during the course of normal human metabolic functioning, but over time they can cause damage to accumulate in the body. Without sufficient antioxidant protection, the damage sustained by these attacks cannot be efficiently handled. Over time, cells, tissues and organs wear down and become inefficient due to chronic free radical damage. Antioxidant substances like BioAstin® astaxanthin may help to inhibit the damages caused by free radical attacks. Routinely using a quality astaxanthin supplement may impede certain effects associated with aging and decrease the risks of developing various diseases and conditions. Mounting clinical evidence demonstrates the anti-inflammatory properties of BioAstin® Astaxanthin. Inflammation occurs when the body experiences some type of trauma. This could be a sprained ankle, a viral infection or consumption of toxic food. In the short term, inflammation causes swelling, heat, pain and redness to encourage and accommodate the healing process. This is integral for survival. Chronic inflammation is not beneficial. In fact, long-term, low-grade inflammation is associated with nearly all diseases. Natural astaxanthin has been shown to control the activities of various inflammatory mediators in the body. By regulating molecules like COX-1 (cyclooxygenase-1), COX-2, interleukin and TNF (tumor necrosis factor), astaxanthin decreases chronic, systemic inflammation. Most supplement products that incorporate BioAstin® Astaxanthin are gluten-free, non-GMO, lactose-free, pesticide-free, and herbicide-free. Naturally sourced astaxanthin is a GRAS (generally regarded as safe) food according to the US FDA. In doses between 4 mg and 40 mg daily, it has been used without causing any side effects for up to 12 weeks. 4 mg daily doses have also been used safely, as ingredients of combination products, for up to one year. BioAstin® Astaxanthin is the world’s leading commercial source for natural astaxanthin. Consumers are advised against using products which may contain synthetic astaxanthin which has been formulated in laboratories. Only natural astaxanthin is GRAS, and it has been shown to be much more biologically active than synthetic versions. Talk to your doctor about the safety of using BioAstin® Astaxanthin before purchasing this product. Let him or her know about any pre-existing health concerns you have and about any prescriptions or herbal supplements you may use. Women who are pregnant or nursing are advised to not use astaxanthin until more is understood about its effects on gestation and lactation. Because natural astaxanthin demonstrates antihypertensive, antidiabetic and other therapeutic potentials, discontinue using BioAstin® Astaxanthin products at least 2 weeks prior to surgery.